Garber Metrology possesses full service surface plate capabilities. At Garber, our skilled and experienced technicians use the most accurate methods to calibrate your surface plates, and will resurface any plates found to be out of specification. Garber Metrology is also your source to purchase new surface plates. 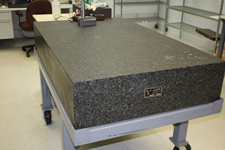 In June of 2009, Garber Metrology purchased Exton Granite Calibration Services, Inc. While Garber Metrology already possessed years of experience in providing surface plate calibration, the acquisition of Exton Granite has made this segment of our business even more robust. Garber Metrology is ISO 9001 registered and ISO/IEC 17025 accredited. Our Quality Assurance program meets ANSI/NCSL Z540-1, and follows federal specification GGG P 463 for granite surface plate resurfacing and calibration. All calibrations are accompanied by Certificates of Calibration traceable to NIST.